We Drink Your Milkshake! : MATHEMATICAL! 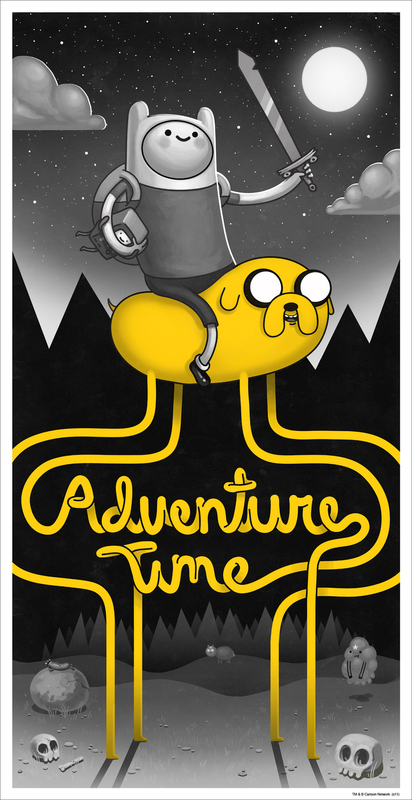 Mondo Doing An ADVENTURE TIME Print. MATHEMATICAL! Mondo Doing An ADVENTURE TIME Print. Javi here. If you guys know anything about me is that I still love cartoons, from the ultra-serious Myasaki features to the old Warner Bros. cartoons and everything in between. There's just something that can't be replicated in live action. All of this goes to say that one of my favorite shows currently on the air is Cartoon Network's ADVENTURE TIME with Finn and Jake. It's the story of two best friends living in a tree in a magical kingdom where people are made out of candy among other things and their adventures. The big news here is that Mondo, the Alamo Drafthouse boutique collectible division, has acquired the license for ADVENTURE TIME and will be doing a series of posters including one tomorrow! Hit the jump for more details. Tomorrow, Mondo will tweet out an announcement for the sale of this poster. They will have a regular version that costs $40 with an edition of 220. Then there's a variant that costs $65 and will only have an edition of 90. Here's a mock up of the two versions! So follow @Mondotees on Twitter and get those wallets ready. Oh yeah, I almost forgot. Apparently Mondo will be doing a series of some obscure comics company.